I write a lot for a living and for fun. So I get caught up in wording – both incredibly awesome turns of phrases and the unsuccessful. So, I ask, is it possible Topps got a computer to write the anecdotes for the backs of the 1993 cards? I’ve never heard of anyone enjoying the distinction of something – it sounds like one of those auto-Fantasy team name generators. Regardless of how the card was worded, it’s a pretty cool footnote on a career to score the 20,000th run in a franchises’ history. 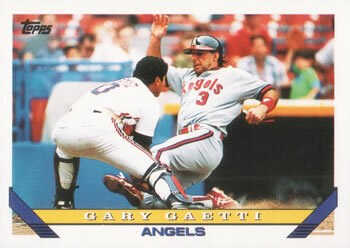 But it’s just a footnote, because what a career Gaetti amassed. When it was all said and done, he appeared in the 43rd most career games (2507) in baseball history – just behind Bill Buckner. He finished with the 36th most doubles by a righty, oddly 36 more than Barry Larkin, Steve Garvey and Luke Appling. He also tallied the 42nd most RBIs by a righty — more than Mike Piazza, Hank Greenberg, Hugh Duffy, and others. 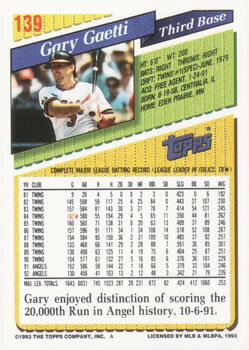 Of course, the bane of longevity is the GIDPs – Gaetti created two outs from one hit the 32nd most times in MLB history. He put in play a twin killing 236 times – one more than George Brett. He also swung and missed a lot – the 21st most times in MLB history. Still, with great Ks, comes great power: he has the sixth most HRs by a 3b in MLB history. In all those games, he ended up participating in the 15th most losses in MLB history and ended 116 of the 1314 games he lost. In addition to his milestone run scores, Gaetti was part of the seventh most triple plays in MLB history and was part of two in one game! Still, he is most known for the 1987 post-season. He was the MVP of the American League Championship with a .300/.348/.650 line with two HRs, which happen to be the first time in MLB history that a player hit homers in his first two postseason plate appearances. Gaetti had a long meandering career worth 37.9 WAR. Hey, he was even used as a reliever twice, by two different teams. He finished with a 7.71 ERA and one strikeout in three appearances.